Tony Mould our Chief Photographer is a very well known face around the city; he has been a volunteer on My Brighton and Hove for a long time. But it is very seldom that we can persuade him to be in front rather than behind the camera. 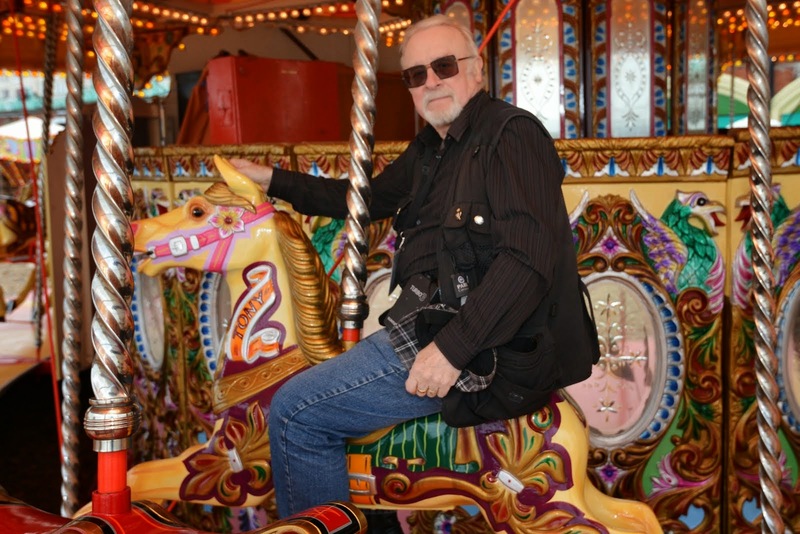 So imagine how pleased we were to catch him posing on the famous Brighton seafront attraction the ‘Golden Gallopers’ carousel. Owen Smith and his family have been running the attraction since 1997. Every year out of season the carousel is dismantled and essential repairs and redecoration is carried out. But this year the whole carousel has been completely redecorated by an artist specialising in this type of attraction. The Golden Gallopers have been the most eye-catching part of Brighton seafront for a very long time. But now with its brand new look it is absolutely stunning. Each of the horses are named for the Smith family and friends. And Tony Mould was absolutely chuffed to find that he has his very own namesake – fame at last! Read more about the Golden Gallopers here.